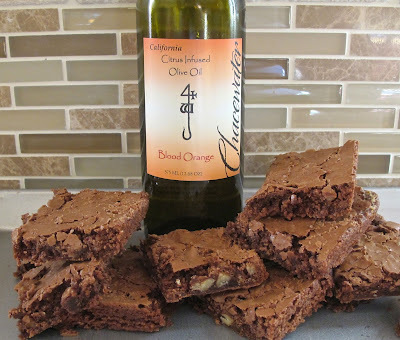 Dear family friend Len, sent us several bottles of olive oil and balsamic vinegar from Chacewater, in Lake County, California which is just north of the bay area. We have been using it for salads and over fish but knowing how Len enjoys a little chocolate, I decided to try it in a brownie. The blood orange brings out the sweetness of the chocolate, we loved it and I think Len will too. What makes this olive oil even more special, is that Len's brother asked him to come and spend some time with him. So Len flew over 3000 miles to meet up and together they went on a road trip sampling olive oils from around the area. Len says his brother declared this one the best! Upon Lens return home, his little brother unexpectedly passed away. So I am reminded each time I use this olive oil, of the brothers precious last moments together, pursuing joy. Grease 9x9 inch baking pan. In a bowl, mix together olive oil, sugar, and vanilla. In another bowl, combine flour, cocoa, baking powder and salt. Slowly add to wet ingredients and stir until blended well. Bake for about 20 minutes, or until toothpick comes out clean.